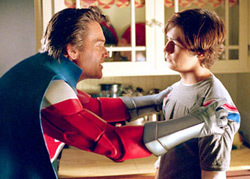 "Sky High" must have felt like something of a homecoming for Kurt Russell. Just like the cheap, low-standards kiddie flicks he starred in as a teenager ("The Computer Wore Tennis Shoes," "Now You See Him, Now You Don't"), it's a cliché-dependent, high-concept Disney cheapy that aims no higher than the unsophisticated standards of its pre-adolescent target audience -- and somehow succeeds in spite of itself. One of many family-oriented superhero movies rushed into production after the boffo box office of "The Incredibles," this story revolves around Will Stronghold (talented Michael Angarano, "Almost Famous"), the 15-year-old son of Commander Stronghold (Russell) and Josie Jetstream (Kelly Preston), the world's greatest superheroes. Will has yet to hit superhero puberty -- Dad's colossal strength and Mom's ability to fly elude him -- so he's instantly an outcast when he begins his freshman year at Sky High, a cloud-floating school for the super-powered. Despite having legendary parents, he's stuck in a class for sidekicks (sorry, "Hero Support"), along with other teenagers whose gifts (for, say, glowing in the dark or commanding plant life) aren't adequately impressive. Beyond blessing the picture with the occasional rib-tickling one-liner, screenwriters Robert Schooley and Mark McCorkle (veterans of Disney Channel's "Kim Possible" cartoon) rely almost entirely on tedious 'tween-movie staples for their plot: Will develops an instant crush on a beautiful, popular senior (Mary Elizabeth Winstead), thereby alienating his equally cute, long-term best friend (Danielle Panabaker) who, in turn, not so secretly pines for him. "Sky High" is also overflowing with trite (albeit "super") stereotypes: bullies from Central Casting, snooty cheerleaders, a cruel gym teacher (drive-in king Bruce Campbell), and a resident badass with flammable arms (played by a very good young actor named Steven Strait), who turns out to be an OK kid after all. Despite this lazy, kids-won't-know-the-difference dependence on formula -- not to mention the movie's soundtrack of awful candy-pop covers of 1980s tunes, its maladroit dialogue (clearly written by adults who have no idea how kids really talk), and frequent lack of adherence to its own internal logic -- "Sky High" manages to turn its campiness and corniness to its advantage. Director Mike Mitchell (of the insufferable "Surviving Christmas" and "Deuce Bigalow: Male Gigolo") doesn't try to make the movie cool or blithely self-aware (save the deliberately action-figurey costumes Will's parents wear to fight crime). If anything, he helps push it farther into the lame-o-sphere with comically awkward characters like Mr. Boy (Dave Foley from "Newsradio"), an over-the-hill forgotten-sidekick schoolteacher (formerly known as All-American Boy) and a dorky "mad science" teacher (Kevin McDonald) with a gigantic brain. As the inevitable villain plot kicks in (an over-the-top arch-rival has a new disguise and nefarious plans for the school and Will's parents) -- and as Will finally develops his superpowers -- Mitchell brings all the movie's inanity to a crescendo of kiddie-flick charisma designed specifically and exclusively to delight children. But somewhere "Sky High" crosses into a realm of nostalgia that will remind parents of the cheap, dumb, slightly behind-the-times movies they didn't know enough to dislike back when they were young. This isn't to say "Sky High" is a good movie -- or even a so-bad-it's-good movie. "Sky High" is something more tenuous: It's persistently dumb in an endearingly sincere way. It's a movie that is entertaining for the very reason that it never tries to be genuinely good.